Every Friday, Whole Foods has a different special deal that is good only for that day. This past week, it was buy one get one free on a special brand of pasta/tomato sauce. I was real excited, as I thought I could use this pasta sauce as a dipping for my next grilled cheese sandwich. The only problem was that I had two get two jars for $8. Sure, that isn’t much money, but when you barely use any pasta sauce, it seemed like a bit of a waste. I passed on this particular deal but did not kill the entire idea. Instead, I returned to Whole Foods trying to find one jar of less expensive, but still yummy, pasta sauce. 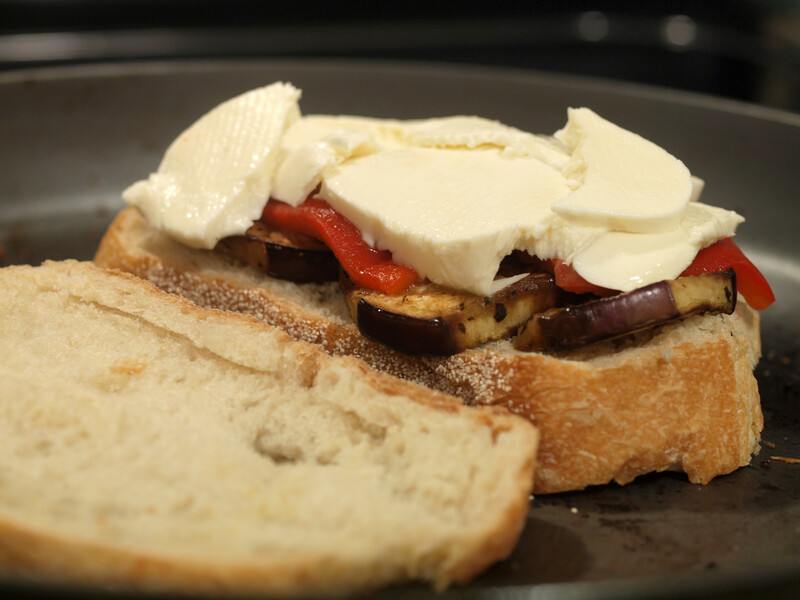 From there, I was on my way…to creating an Eggplant & Roasted Red Pepper Grilled Cheese. Once I suggested the pasta sauce, eggplant was suggested by the sous chef. I thought, sure, why not? 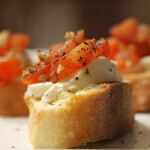 It sounded like a great, Italian idea to me. For some reason, I was opposed to breading the eggplant. I didn’t want that for this sandwich. Instead I grilled/sauteed the sliced eggplant in a pan with some balsamic vinegar, olive oil, salt, pepper and some dried basil. 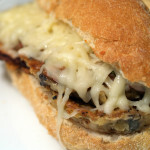 I should have tasted one piece while cooking, because if I had, I would have realized the eggplant needed something. I am not sure what it needed though. Maybe more balsamic vinegar, maybe an additional flavor, maybe something else?! I am not sure. Regardless, it needed something. If you have any suggestions, please leave them in the comments. 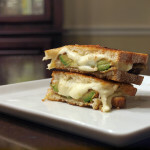 How would you have prepared the eggplant for this grilled cheese? 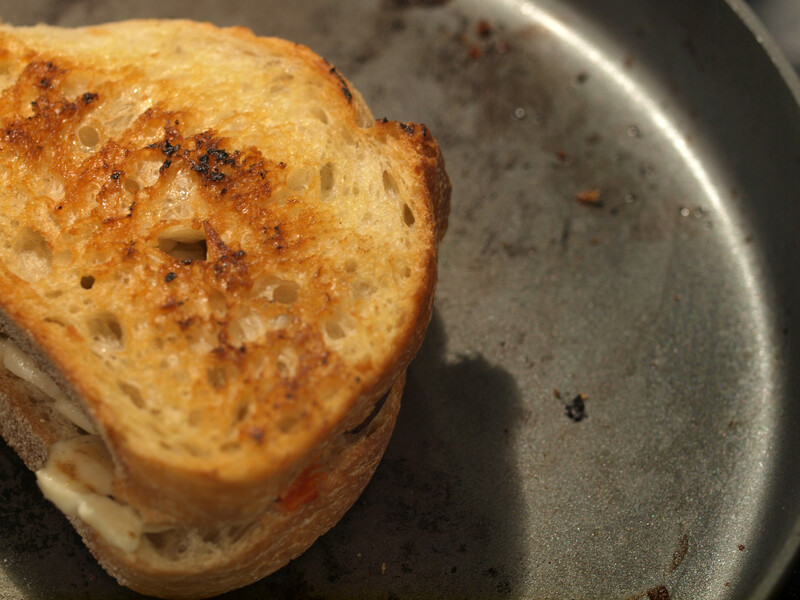 I had wanted to use Whole Foods’ roasted red peppers for a previous grilled cheese but it didn’t fit. It seemed to work perfectly for this sandwich so I bought a small package. Upon taking off the lid, I was taken aback by the spice/kick but very excited to finally taste them. However, I was disappointed when I took a bite of the grilled cheese and didn’t get anything. The extreme kick I was looking for was not there in the least. Even when I added another piece. Sauces ‘N Love Pommodoro & Basilico pasta sauce was on sale for $5 and the perfect size for someone who rarely uses pasta sauce. The taste didn’t blow me away, it is just pasta sauce after all, but it was still very yummy. It was one of the brighter spots in this dish. 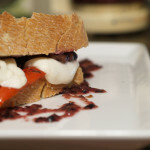 After eating this grilled cheese, I toasted some leftover bread with mozzarella cheese and dipped it in this sauce. Perfect combination. 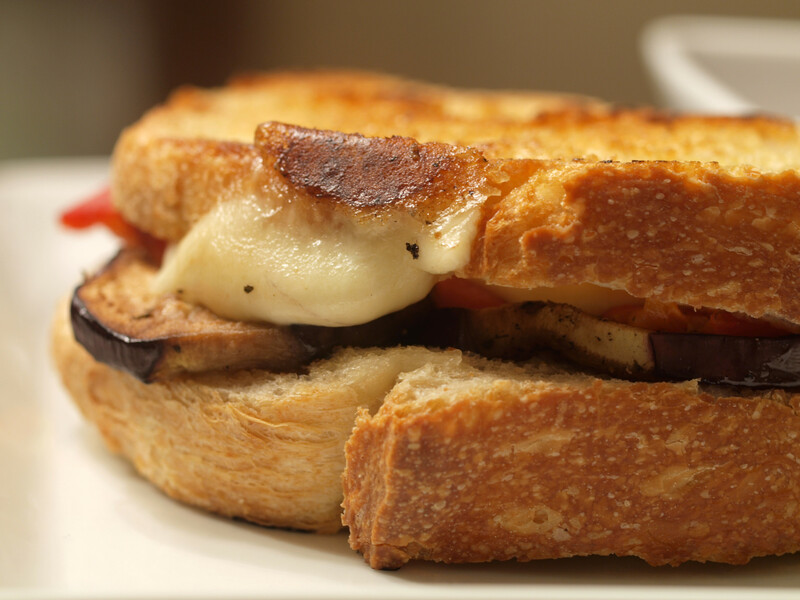 The bright spot in this grilled cheese was this crusty on the outside, soft on the inside Italian bread. It was perfect in all respects. 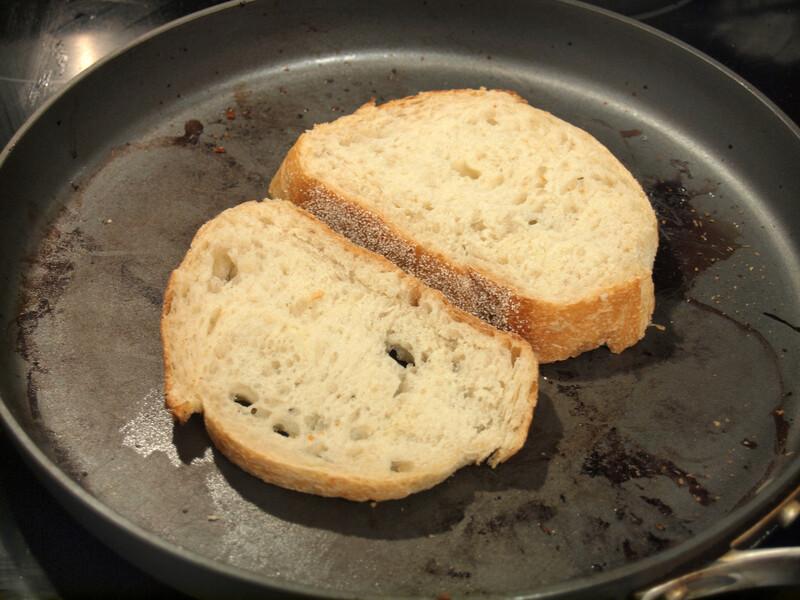 Instead of using butter, I went ahead and used olive oil on the bread, allowing the grilled cheese to crisp/brown better. The end result was a bread that had great color and amazing crunch. I had high hopes for this grilled cheese but unfortunately, they didn’t materialize. Something was lacking. 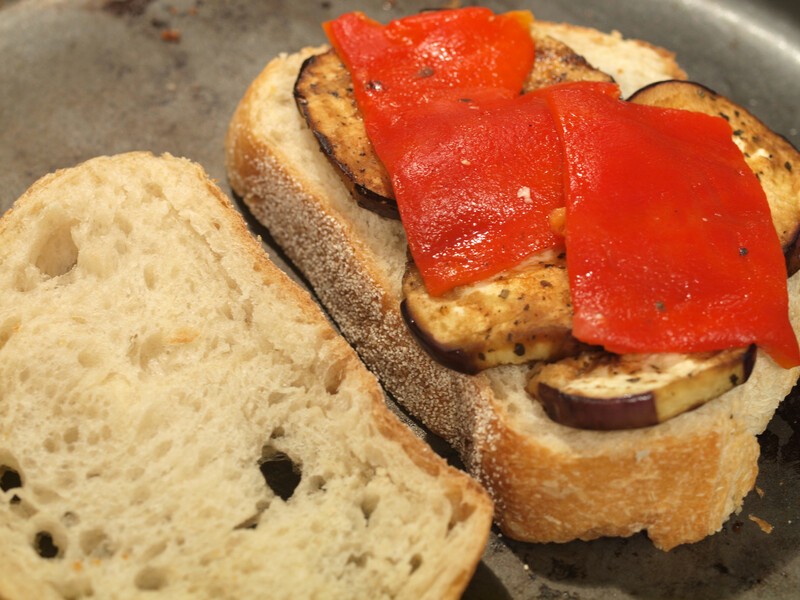 The eggplant got lost and as already mentioned, the roasted red peppers simply lost their kick. I even added more ingredients for the second half, but unfortunately, that didn’t help. The bread was perfectly cooked and dipping the grilled cheese into the sauce was nice, but those two positives couldn’t save the sandwich from its negatives. I gave it a B because the flavor was not bad; it was simply missing something. 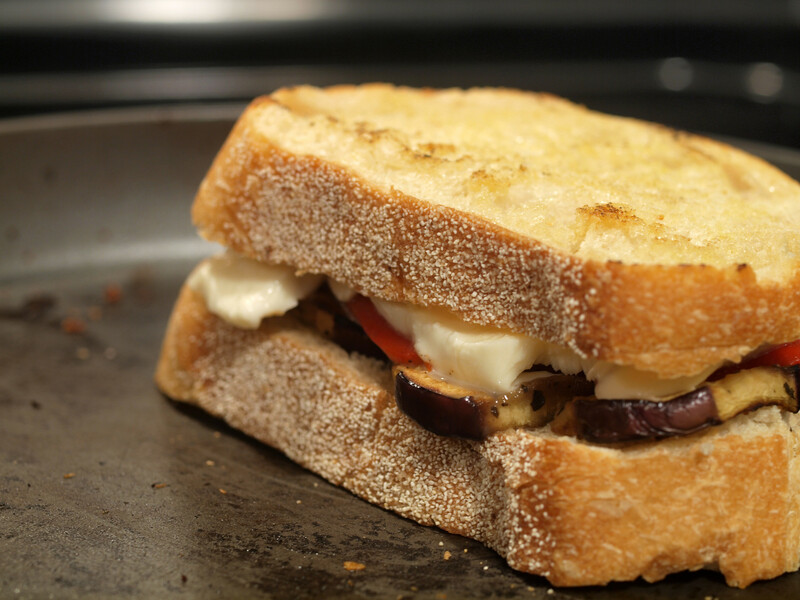 The grilled cheese would have tasted the exact same if I didn’t include the eggplant or peppers, and that says a lot. Please, I would love to hear how you would improve on this grilled cheese. Make sure to leave your suggestions in the comments below. 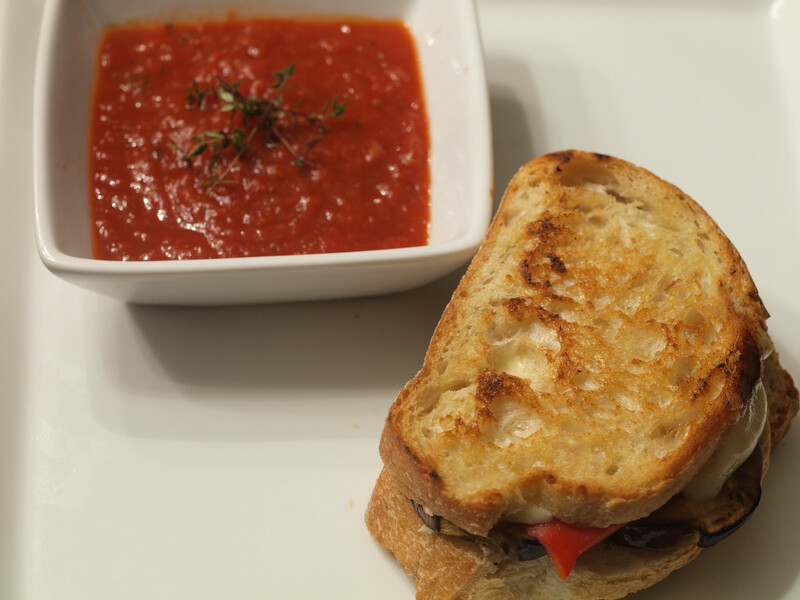 Posted in Grilled Cheese and tagged B, balsamic vinegar, eggplant, grilled, italian bread, mozzarella, pasta sauce, red peppers, roasted red peppers, tomato sauce. When I used to work in a Middle Eastern deli, I got to eat some Ramadan meals with my co-workers. They always had a plate of fried eggplant and tomatoes that was so heavenly scooped up with bread. The eggplant takes on a whole new texture and taste if cooked enough, and the tomato is fried, but still tart to balance the deep eggplantiness. I would say the red pepper is for another sandwich. For this one, take red pepper flakes, eggplant cooked to the right mushiness, sliced roma tomato, and I’m not sure what kind of cheese, maybe a middle eastern kind! I tried this out and added more of what I like. Whole leaf fresh basil under the cheese. It was amazing! Eggplant soaks up everything. I always saute it heavily in oil to virtually make it water proof. This way the flavor of whatever I add next to it sits right on top for me to enjoy it. 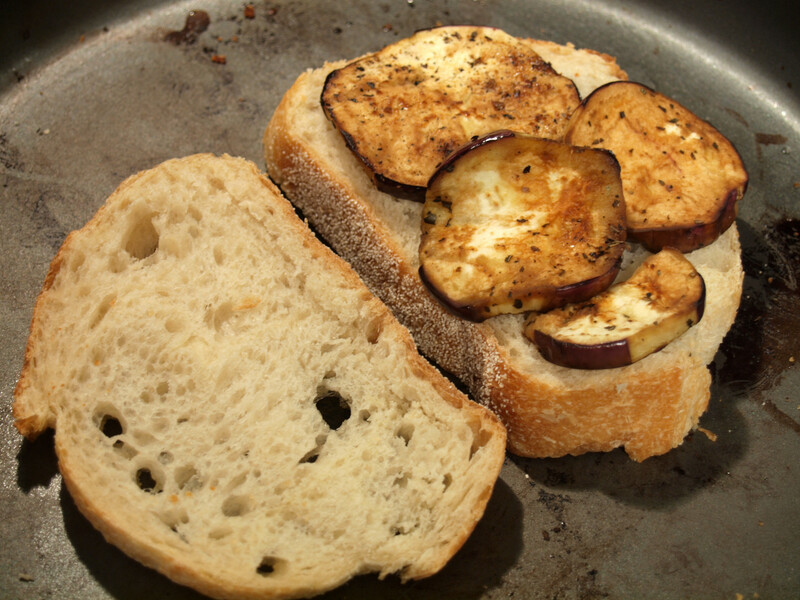 Balsamic is the perfect after you cook the eggplant like this. 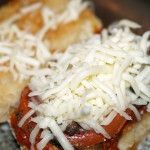 Truelly one of the best grill cheeses I will ever have with these slight changes.